The Kindle Fire, the iPad, e-readers: What happened when I abandoned print for pixels. What happened when I abandoned print for pixels. Towards the end of last year it became apparent that the Stourton household was heading for a book crisis. My wife and I both brought substantial collections into our marriage. I get a steady stream of review copies and manuscripts from friends and acquaintances hoping for endorsements. She makes factual television programmers and is often sent books by aspiring producers and presenters. I am incontinent when the urge to buy a new hardback novel comes upon me, and she reads incredibly quickly. All these factors had conspired to fill our shelves. The books had become Triffid-like, taking over our home and lives. Something had to be done. I also—partly at the instigation of the editors at the FT, and very much through gritted teeth—promised to try an e-reader. It might, we thought, be one solution to the overstuffed shelves. And I said I would report back on my reading habits, both paper-based and electronic. Eleven months on, abstinence from new book buying has proved one of the hardest challenges I have ever undertaken—far tougher than giving up alcohol (which I have had to do on reporting trips to Saudi Arabia) or any Lenten effort I have made to deny myself some pleasurable form of food. It means avoiding what in Catholic teaching are known as “occasions of sin”. Bookshop windows become bright bordellos of temptation, and a walk down Piccadilly (Hatchards and a huge Waterstone’s within yards of one another) is like some Homeric trial of will. I also realized that I had to stop myself reading the review sections of the weekend papers. On Saturdays and Sundays, I find that my eyes naturally slide away from the heavyweight political commentaries I ought to be reading for work purposes and on to the books pages, and giving into that temptation is one of my great weekend pleasures—not, in normal circumstances, a very grave sin. But a glowing review of a new book by one of your favorite authors is simple torture when you cannot buy it. I did, I confess, find some inventive “professional reasons for bending the rule”. The most pleasurable was a serendipitously timed invitation to chair the judges of the Desmond Elliott Prize for a first novel. I had to finish 10 books over a period of six weeks or so—enough to satisfy my new book lust for a while and, of course, the books were sent to me for free, so I could add them to our crowded shelves without feeling guilty about breaking my vow. On the other hand, they were extremely good (I recommend Anjali Joseph’s Saraswati Park, the winner, and, the other two finalists, Boxer, Beetle by Ned Beauman, and Pigeon English by Stephen Kelman), so the experience also made me feel antsy about all the other new writing I was denying myself. The other excuse I found to break my vows was associated with a Pyrenean trek. This summer I took part in a four-day commemorative hike in the footsteps of second world war escapers and evaders (I am making a BBC Radio 4 series on the subject). The experience opened a door on to such a fascinating chapter of history that it is growing from a radio series into a book project and I have begun to read some of the memoirs written by those who made the journey “for real” during the dark days of the Nazi occupation of France. These tales were popular in the 1940s and 1950s, when memories of the war were still vivid, and some of them—such as George Millar’s Maquis and Horned Pigeon—are still classics. Others are out of print and, rootling around on Amazon and AbeBooks, I discovered that you can buy first editions and early reprints for really not very much money. So I have been buying like crazy. It is almost impossible for people of my age or younger to manage the imaginative leap required to get inside the minds of those who made that journey some seven decades ago. But reading what they did in a book printed close to the time of their exploits helps. There is a period feel to these early editions that takes you closer to those who wrote them. All of this has restricted the reading time I have been able to devote to our existing collection of books—the only one of my vows I was really looking forward to. I began by revisiting Evelyn Waugh and Graham Greene, and honesty compels me to admit that I have got no further. Indeed, I find that I am in no great hurry to get further. Waugh’s Sword of Honour trilogy has restored to me the youthful pleasure of laughing loudly at a book in public places, while Greene’s The Quiet American, my current bedside companion, leaves me as awestruck as I was when I first read it as a teenager. How can anyone do so much with so few words? Here is a cheerful conclusion: on the basis of the experiment to date I am persuaded that, if I have to, I can go on re-reading my existing library without ever getting bored—I estimate I have enough good literature in the house to last me for the rest of my life. So why bother with an e-reader? Well, a promise is a promise. I bought my Kindle in April. It was a purchase made without pleasure and for weeks it lay unopened in its Amazon box—a sullen presence sulking on my desk. Only when the BBC sent me on assignment to investigate corruption in the nations of the former Soviet Union was I galvanized into powering it up. It was one of those reporting trips that really test your physical stamina. There were several days of frantic scurrying around Moscow collecting interviews, followed by an overnight sleeper to Kazan, the capital of Tartarstan. The drunken Russian oil engineer who shared my compartment thought he spoke English but he was mistaken; the unbroken miles of birches that flashed passed as we rattled through that night seemed never-ending as he fired out words that never quite added up to a coherent sentence. Then there was a complicated sequence of flights to Ukraine, more journeys in cramped taxis, and finally a long flight home. I spent quite a lot of time hanging around in the antechambers of the rich and the powerful waiting for interviews. Easy access to reading material is essential to staying sane on such a trip. 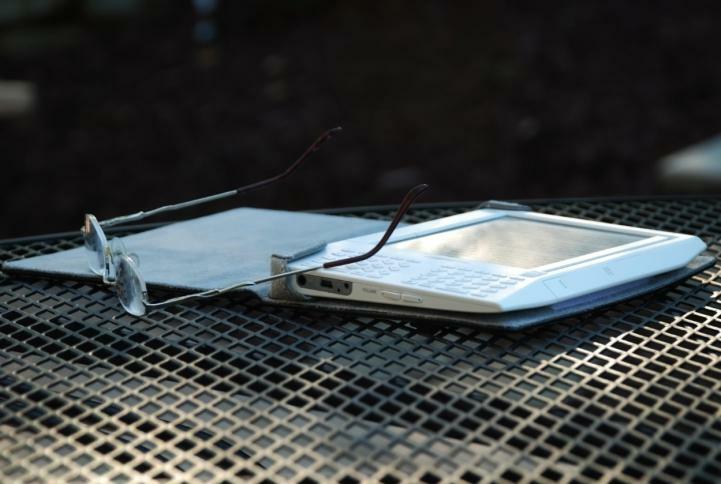 The Kindle passed this test with flying colors; indeed, it proved itself the ideal reporter’s companion. It is light and a convenient size—you can just about stuff it into a jacket pocket. Downloading a book takes seconds (if you have an Amazon account, you pay almost without noticing the transaction, which can be dangerous). It never ran low on power, flashing cheerfully into life whenever I needed a distraction. By the time I reached Kiev I had discovered that I could buy newspapers wirelessly, and I used the Kindle to read them over breakfast in a floating hotel on the Dnieper river. Even my producer, a battered paperback man, was impressed. My conversion—and I sense this is a common experience among those who have taken the plunge—was swift but far from complete. I might have chosen The Book Lover’s Tale to begin my e-book life out of a sense of irony—in fact, I did so because the book is my eldest son Ivo’s second novel. Its publication coincided with my purchase of the Kindle and I have, of course, bought several hardback copies as well as the e-book. My bibliomania is still at the benign stage; I love having books about me so I can look at them, revisit them and (sometimes) share them. The way Ivo writes about books has hurried me to a conclusion I would have anyway reached before long; if I buy and like a book on Kindle, I shall almost certainly buy a hardback copy too. So I shall end up spending more money, not less, as a result of the e-book revolution. It is just possible, however, that the e-reader will kill the paperback; I have done my Waugh and Greene reading with old paperbacks and, handsome as those Penguin covers are, there is no denying that they are, at best, fragile. The Kindle is remarkably resilient. During our summer holiday in France, our dog leapt out of the lake and thwacked mine—it was lying on the picnic rug—with a wet paw; he inflicted no damage at all. So if I need to buy a new copy of The Quiet American before I finish rereading it (quite possible, given the signs of strain on the spine of my venerable copy), I can imagine downloading it rather than buying a new paperback. But Kindle’s recent advertising carries one of the silliest boasts I have ever read: it can store 3,500 books. Assuming I live for another 25 years (which would take me to my late seventies), I would need to read 2.6 books a week to reach that total. More to the point, what possible sense would it make to substitute a thin grey slate-like object that I might forget on the Tube for the groaning shelves of the beautiful and instructive artifacts that adorn my house? I am keeping my Kindle but I am giving up my vows of abstinence. I have started reading the reviews again and have already drawn up a list of hardbacks I would like to buy. I am off to the shops for a bender. We shall just have to find more room somewhere.